There are various activities nearby the villas, but if your goal is simply to relax there are a bunch of things to do on the farm, too! There is a 2&half;-mile trail around the perimeter of the farm. We keep the trail cleaned and bulldozed on a yearly basis, so it is perfect for walking, horseback-riding or an ATV excursion. The property is fully fenced, just watch for the blue-topped white fence posts. When you visit our old-growth forest, you might see the howler monkey troupe that lives in the area (especially if the mangoes are ripe). There are toucans, parrots and the occasional Blue Morpho butterfly that are also found in this area. We have two 250cc Can-Am ATVs and a 6-passenger Kawasaki Mule available for rental. The vehicles are all road-licensed in Costa Rica, so they can be driven into town as well as the designated farm trails1. $15-per-hour or $40 for the day. $15-per-hour or $50 for the day. If you'd like to explore some of the more out-of-the-way spots in the area, we offer a 4-hour tour for $100.00. There are six horses on the farm — all available for riding1 and/or petting. They all have excellent dispositions and, like the goats, are very fond of bananas. Rates: $15-per-saddle-up and $15 per hour; the first saddle-up each day includes 1-hour of riding. Want someone to accompany you on your ATV, mule or horseback-riding adventure? No problem, just ask! Our rate is $15.00 per hour. We have many, many fruit trees on the farm so there is usually some type of fresh fruit available to be picked; there are usually various types of citrus and bananas available for your pleasure. There's nothing better than a fresh-picked Ruby Red grapefruit for breakfast! Seasonally, there are carambola (starfruit), mangoes, dragon fruit, guanabana (soursop), mulberries and Jamaican (or Barbados) cherries. There is a barbeque area next to the villas where you can have a picnic and enjoy the breezes and beautiful views. Just ask and we'll roll out the gas grille for your use. If you are a hot-pepper aficionado, feel free to come to the first (pink) villa and pick peppers right off the plant for your meal. Be careful with the ghost and scorpion peppers, they are very hot! Our goats are very people-friendly — and they love bananas and the other fruits available on the farm! Make a new friend and feed the goats. If you would like to interact with the goats, just ask someone on the farm and they will let you into the goat-pen. 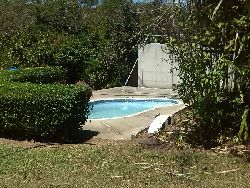 There is a small dipping pool on the farm that is a short walk from the villas. It is the perfect place for an afternoon drink to watch the sunset … or just to cool off. 1We reserve the right to refuse service to anyone or to require a guide for inexperienced riders.